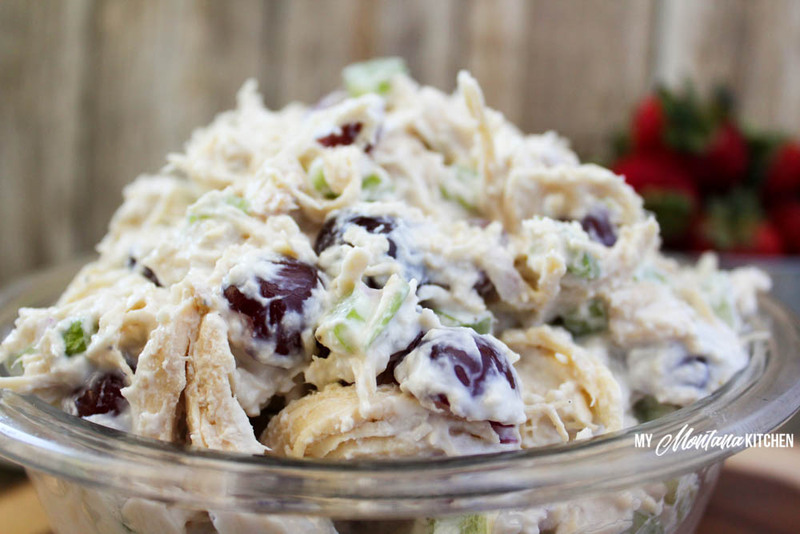 This creamy chicken salad relies on Greek Yogurt to keep the fat content low, but the flavor high! Sliced grapes add a pop of sweetness. This Healthy Chicken Salad recipe is low fat, sugar free, gluten free, and can be either a Trim Healthy Mama E Fuel or Full Pull! 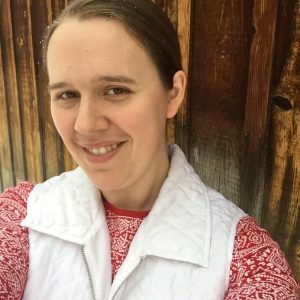 I remember many years ago planning a special date for my boyfriend (who is now my husband). I called his mother to ask what one of his favorite picnic foods would be. She told me that one of his favorites was Hawaiian Wedding Salad. I had never heard of that, but she explained that it was basically chicken salad with grapes and a bit of sugar to make it sweet. 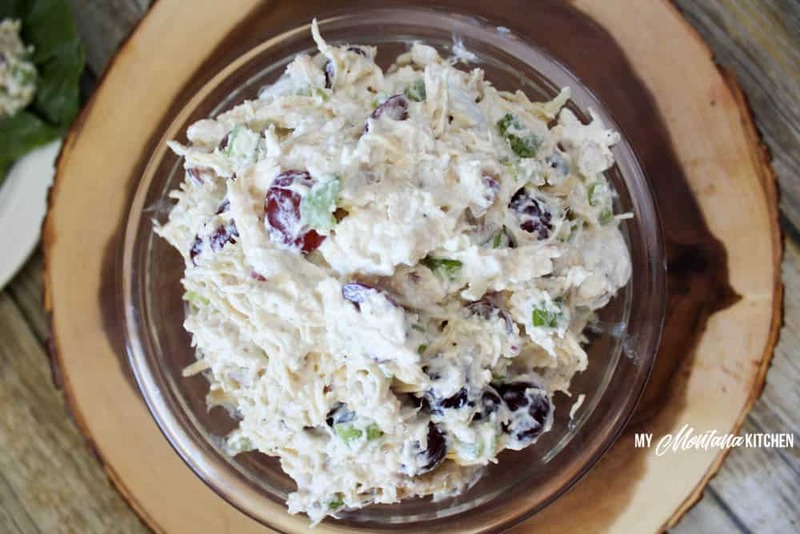 If I recall correctly, I did make that dish for our picnic, and I have loved adding grapes to my chicken salad ever since! They just give a delightful little burst of sweet! We have now been married for nearly 12 years, and Chicken Salad is still one of his favorite things to keep on hand in our refrigerator. However, if you are a Trim Healthy Mama, you know that Grapes are an E fuel (healthy carb), and mayonnaise (generally used for chicken salad) is an S fuel (fat). That gives us a gigantic Crossover! Crossovers are on plan, but they are not conducive to weight loss. So, I wondered, what would happen if I substituted some of the mayonnaise for plain Greek Yogurt? Not only did it work, but it also adds another great source of protein to the Chicken Salad. In fact, 2 cups of Kirklands brand 0% Greek Yogurt (the brand I use from Costco) has 46 grams of protein! The chicken breast is also a good protein source, so this Healthy Chicken Salad recipe becomes a powerhouse of protein! 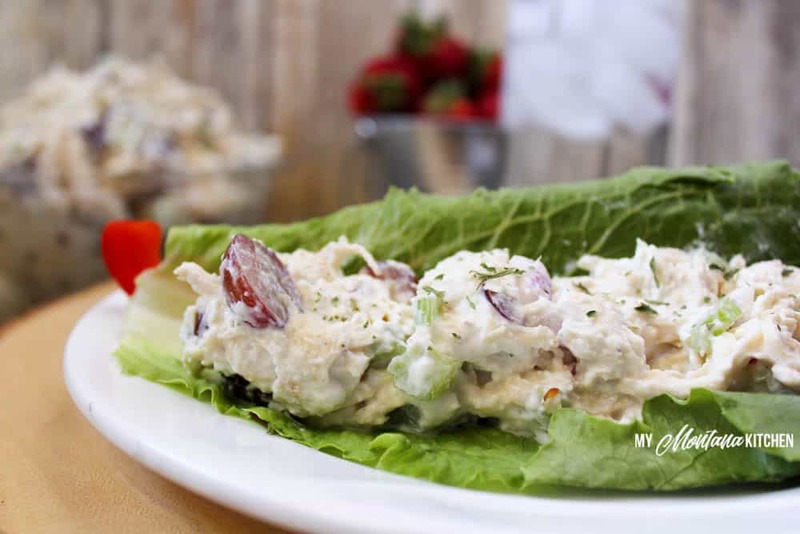 If you are interested in turning your Fuel Pull Chicken Salad into an E Fuel, simply add 2 Cups of sliced grapes and eat it with sprouted bread, or another carb source. With the 2 cups of grapes spread out over 8 servings, you could easily have your salad on sprouted bread for a delicious E meal! I made this Chicken Salad for picnics last summer, along with my Sweet Potato Salad, which is also an E Fuel. Since you need shredded chicken for this recipe, here is a tip on how to shred your chicken easily. Perhaps you already do this, but did you know you can shred your chicken using the paddle attachment on your stand mixer? Simply place the cooked chicken breasts in your bowl, and mix for 10-15 seconds, until the chicken is shredded. This also works with hand mixers! Plain 0% Greek Yogurt can be a very versatile protein source, and we use it often in our kitchen. My absolute favorite way to use yogurt is in this Power Yogurt Bowl. But it is also great for Peanut Butter Cookie Dough Greek Yogurt and Oatmeal Cookie Frozen Yogurt! So what do you need for this Healthy Chicken Salad? Mix all your ingredients together in a large bowl, and refrigerate for 2 hours for best results. For an awesome E meal, eat this Healthy Chicken Salad on Sprouted Toast! If you do not have Gentle Sweet, you can make my DIY version, or use 1/2 Tablespoon Pyure. Love your recipes. 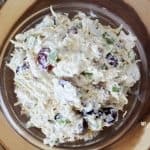 I have used grapes & Greek yogurt in my chicken salad for years, (before THM), but this has a couple of ingredients I haven’t used so this is a keeper for me! Thank you for being so generous with your good recipes!! Just what I needed today thank you! What brand yogurt do you use? I use the Kirklands brand from Costco, but any brand of plain 0% Greek yogurt should work fine. This salad is gorgeous! I can’t wait to make it for family. Can you eat anything else with this? Or maybe an extra half sandwich if you are really hungry? Oh yes. I like to eat raw vegetables with it, or you could add a FP muffin. Or yes, even an extra half a sandwich to stay in E mode!